The aircraft involved in this accident was a four-engine Lockheed Electra L-188, registration N5533. 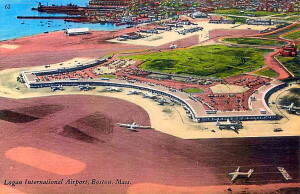 At 5:40 p.m., on October 4, 1960, Eastern Airlines Flight 375 was departing Boston’s Logan International Airport on runway 9 with 67 passengers and a crew of 5 aboard. Just seconds after becoming airborne off the runway, a flock of starlings flew into its path and some were sucked into three of the four engines. The aircraft then yawed to the left and decelerated to stall speed as it continued forward towards the harbor at the end of the runway. Once over the water the left wing dropped while the nose pitched upwards and the aircraft dropped almost vertically into the water from and altitude of about 150 feet. Only 10 of the 72 persons aboard survived the crash. Two of the survivors were members of the crew, and nine of the ten survivors suffered serious injuries. The accident was witnessed by numerous witnesses on the ground, two of whom happened to have cameras and took pictures while the plane was still airborne. The photos were given to investigators.